Procedure codes represent the services that you render and products that you sell. Your Dentrix Ascend practice database comes with all the current ADA Procedure Codes, which are updated automatically as needed, but you can create alias procedure codes for your organization. An alias code is a procedure code followed by a period (.) and then a custom alphanumeric value up to five characters in length. 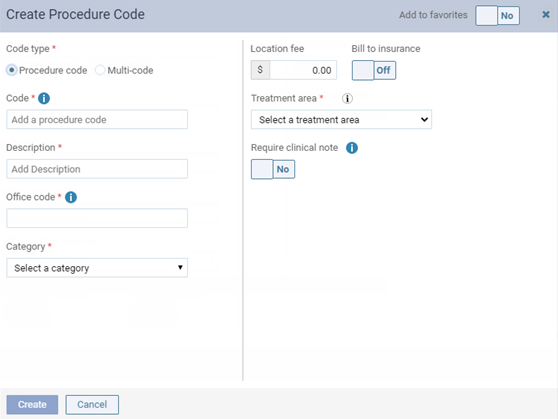 Having an alias code (alternate code) allows you to have duplicate procedures in your organization's database, so you can, for example, charge different rates for similar procedures but have the same ADA Procedure Code show on claims. Note: When you add a procedure code, Dentrix Ascend automatically adds it to every fee schedule in all locations of your organization. Additionally, the fee for the procedure code in the current location's preferred fee schedule will be the same as the procedure code's default fee. However, all other fee schedules in all locations will have a $0.00 fee for the procedure code, so you must manually specify a fee for the procedure code in every other fee schedule in every location. On the Procedure Codes tab of a location's Procedure Codes & Conditions page, click (or tap) Add Procedure Code. Note: You may want to verify that the procedure code that you want to add does not already exist before attempting to add it. You can do this before or after clicking (or tapping) Add Procedure Code. To do it before, with All selected in the View list, type a code or description in the Search For Specific Procedure box. The Create Procedure Code dialog box appears. Leave Procedure code selected as the Code type. You cannot change the code type once you save the procedure. Type the Code of an existing procedure, and then type a suffix for the code (for example, if you want to create an alias code for D0330, you can create a procedure with "1" as the suffix) in the additional field that appears. You cannot change the code once you save the procedure code. Set up the other options as explained in the topic about adding procedure codes.